The Undertaker's WWE return, Kenny Omega's title defense and news of a future Brock Lesnar-Daniel Cormier fight highlighted a night to remember in pro wrestling. SAN FRANCISCO – The Undertaker returned to Madison Square Garden, Kenny Omega made his first-ever defense of the IWGP heavyweight title, and Brock Lesnar sat cageside at UFC 226 and will challenge new UFC heavyweight champ Daniel Cormier, potentially as soon as this November in New York at MSG. And no, the Bullet Club is not fine. The Bullet Club entered into a civil war at New Japan’s “G1 Special in San Francisco,” with Tama Tonga and Tanga Loa of the Guerrillas of Destiny attacking Omega, Cody Rhodes, and the Young Bucks after a brilliantly orchestrated 32-minute main event. The biggest news to break from Saturday was the news that Brock Lesnar will challenge new UFC heavyweight champion Daniel Cormier, potentially as soon as UFC 230 on November 3 in Madison Square Garden. The Garden, of course, is the WWE’s home turf but is a building that is rarely used for pay-per-views. WWE has found a new home with Brooklyn’s Barclays Center, but UFC president Dana White still relishes having pay-per-views at MSG. Lesnar allegedly re-entered the USADA pool for drug testing, but was hidden from public view, which is a story worth exploring. His return to the Octagon all but ensures he will drop the WWE Universal title by SummerSlam in August at the very latest. A fight camp customarily takes between six to eight weeks, so Lesnar could presumably lose the WWE title in August and start his training on time in September. Lesnar’s return to the UFC also casts a serious shadow over the WWE future for Paul Heyman. Along with their father, the legendary Haku, Tonga and Loa laid out Kenny Omega, the Young Bucks, Cody Rhodes, “The Villain” Marty Scurll, Hangman Page, Chase Owens, and Yujiro Takahashi to close out the show. New Japan conducted post-match press conferences after almost every match, but canceled Omega’s session with the media due to the injuries inflicted by Tonga and Loa. Now the question is whether Bad Luck Fale will side with the north or south of the Bullet Club, as he will have to decide between Omega’s side or join the revolution with Tonga and Loa. Omega defeated Rhodes with his one-winged angel finisher in a match that lasted over 30 minutes and accomplished multiple objectives. Omega delivered a captivating title match in his first-ever defense, showing that he does not need Kazuchika Okada standing across from him to ensure a compelling title match. The night also served as an opportunity for the 33-year-old Rhodes to prove that he is a legitimate main-event talent. Rhodes’ AXS TV match against Okada from a year ago was good but far from great. In addition to developing a multi-layered character, Rhodes has enhanced his in-ring work to the point where his matches belong at the end of the show. Both Omega and Rhodes deserve considerable credit for pulling off a tremendously difficult feat: the Omega win had value but the loss by Rhodes did not hurt his standing. Rhodes’ apparent face turn from the end of the show will help in his pursuit of the NWA world’s heavyweight title, which he challenges for at the end of the summer at the All In supershow on September 1. The Undertaker also made his WWE return, inching closer to challenging WWE Universal champion Brock Lesnar for more appearances in 2018. The Undertaker, Braun Strowman, and Roman Reigns defeated Kevin Owens, Elias, and Baron Corbin in the live event at MSG, with ‘Taker hitting the Tombstone piledriver on Owens for the victory. Reigns and ‘Taker, who shared the ring together in the WrestleMania 33 main event, had a staredown after the match that ultimately ended with a handshake. The next scheduled appearance for The Undertaker is at WWE’s Super Show-Down on August 6 in Australia when he wrestles Triple H.
A former WWE talent in Juice Robinson sent shockwaves through the wrestling community when he rolled up Jay White to win the IWGP United States championship at the New Japan show in San Fran. Robinson’s CJ Parker character never fit in NXT, and he generated negative reactions whether he worked as a babyface or a heel. But New Japan offered a different opportunity, and the 29-year-old native from Illinois–who is the first American-born wrestler to ever win the IWGP U.S. title–feels at home in New Japan. “The United States championship matters, and now, Juice matters,” said Robinson, who fought the match with a broken left hand. “All of a sudden, presto change-o, you leave NXT, the only place that’s supposed to matter, where I was told when I left by [Senior Director of Talent for WWE] Canyon Ceman, ‘Joe, go out and make yourself a star.’ Look, it’s taken three years, but I landed on my feet. Dragon Lee and IWGP junior heavyweight champion Hiromu Takahashi combined for arguably the show-stealer at the New Japan show through an outstanding blend of athleticism, storytelling, and breathtaking moves. In addition to his match against Takahashi, Dragon Lee also fought three matches on Friday night at the joint All Pro Wrestling/Pro Wrestling Revolution show in Daly City. Lee defeated New Japan’s Ryusuke Taguchi, Brody King, and Flip Gordon to capture the King of the Indies tournament. Lee, Takahashi, and Will Ospreay are the three best junior heavyweights in the world, and they all wrestle for New Japan. The Young Bucks continued to capture people’s imagination with their G1 Special victory over EVIL and Sanada to retain their IWGP tag team titles. An ingredient that the Bucks include in their matches better than any other tag team in the world is a seemingly instant chemistry with their opponents. That chemistry is on display whether the Bucks work the Briscoe Brothers, EVIL and Sanada, or even the duo of Pentagon and Fenix, who they would like to work with on a more consistent basis. The Bucks have no more titles left to win with the exception of the WWE tag team titles, which was discussed after their G1 Special victory. 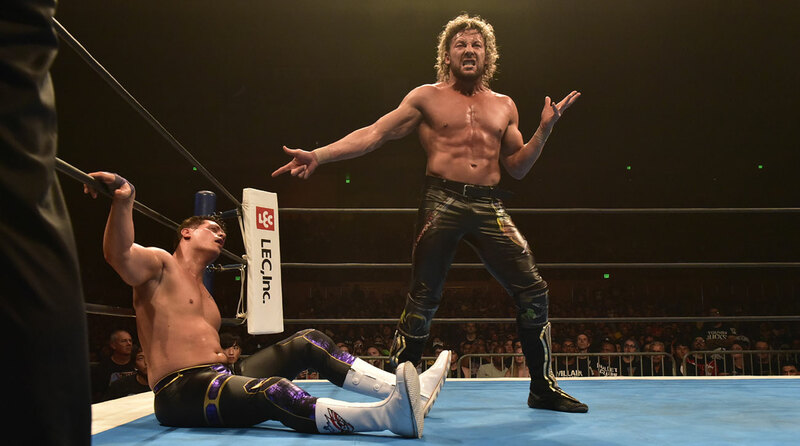 Clean finishes are not always possible in pro wrestling, but Saturday’s New Japan show gave viewers nine matches with nine legitimate finishes. Wins and losses do matter in pro wrestling, but the real art is in the storytelling. For those who enjoy the New Japan product, the company now enters into one of its most exciting times of the year as the G1 Climax begins next week on July 14.